Centipede is incredibly additive and like every aspect of the game is perfectly balanced and tuned. It's also exceptionally hard, and game sessions rarely last for more than a few minutes. Based on possibly Atari’s finest moment as a coin-op manufacturer, 2600 Centipede captures all of the gameplay of the arcade original. You know you have a fine port when the graphics are so blocky and basic but no one seems to care. Centipede already handles nice and smoothly with a joystick but the even better news is Atari released a trakball peripheral, bringing players even closer to the arcade experience. Forget the graphics – Centipede for the Atari 2600 is virtually faultless. Insbesondere die Color-Variante dieses Game ist sehr schön gezeichnet und steht den Originalvorbild in fast nichts nach. Besonders viel Spaß macht jedoch der Zwei-Spieler-Modus via Link-Kabel, in dem Ihr mit zwei Game-Boys wahlweise zusammen oder gegeneinander auf Punktejagd geht. Eine prima Umsetzung des Klassikers, der bis heute nichts von seinem Reiz verloren hat. Wer sich noch die gerade erschienene Playstation-Version besorgt, kann mit der Game-Boy-Variante unterwegs für den nächsten Highscore üben. Absolut empfelenswert. Centipede may be the most addictive shooter ever created, and this stellar 7800 version pulls out all the stops. We're talking mad fun here. Not only does this wonderful translation feature the same beautiful graphics, sounds, and adrenaline-soaked gameplay as the arcade, but it includes two-player simultaneous modes! That's right, now you and a friend can either compete for score, or join forces in the mother of all exterminations. If you don't love that, you need to have your head examined. The visuals are faithful to the arcade except for the four-legged spider (who appears to be holding maracas) and the white border. The animation is super smooth and the mushrooms have a nice 3D appearance. The Atari 2600 trak-ball works okay, but a good joystick provides the best control. Centipede's gameplay is as challenging as ever, and four skill levels are included. Like Asteroids for the 7800, this may be the definitive home version of an arcade classic. Even women tend to gravitate towards this game - probably due to their distain for bugs! The huge, hideous spider is a bit slower here than in other versions, but he also tends to linger near the bottom of the screen -- preventing you from getting a good shot at him. The scorpion shows up early and often, and at 1000 points, he's always worth taking a shot at. By poisoning the mushrooms, he indirectly leads to most of your deaths. Centipede has three skills levels and comes with my highest recommendation. All in all, Centipede is a 2600 title which will make any fan of the arcade game smile. Since the cartridge is fairly easy to find, you can probably pick one up for next to nothing off of eBay, a decent vintage gaming store or your favorite flea market or garage sale. And in conclusion, I can't really say anything bad about this severely classic game. After all, not only do you get to kill gnarly bugs, but you don't have to scrape off your shoes afterwards. This Atari 5200 conversion captures the challenge and fun of the arcade hit, and is surprisingly hard! Your cannon can move freely around the lower part of the screen, blasting mushrooms, bugs, and centipede that slither down from the top (and break into parts when shot). Unlike the vertical screen of the arcade game, this translation features a horizontal playing field so the action is flattened out a bit. The centipede make their way down the screen faster, and the spider tends to move in sideways patterns - and often attacks like a heat-seeking missile! Since he's large and can move at blinding speeds, it's hard to avoid him, much less get below him for a shot. Equally hazardous are the falling fleas, which usually ram your cannon when you attempt to shoot them. If you have the track-ball controller, you'll want to use it for the full arcade experience, but the normal controller works surprisingly well. All the elements of the arcade have been retained, including the diving fleas and poisonous scorpion (worth a cool 1000 pts, by the way). If you own a trak-ball controller, that adds a nice arcade flavor. There's only one skill level, but the difficulty ramps quickly, and you'll find yourself hitting reset again and again as you attempt to beat your high score. It's easy to scoff at its marginal graphics, but a few rounds Centipede for the 2600 will make you a believer. Centipede is a delight to play on the Colecovision. The graphics are crisp and more detailed than many home ports of Centipede. The action is no less than frantically exciting. Although it doesn't compare to the arcade or 5200 versions, this Centipede adaptation is one of the best VCS games available. So und nicht anders müssen Arcadeportierungen sein: Wer Centipede schon auf anderen Konsolen verfallen ist, der wird diese Version lieben. Technisch identisch mit dem Spielautomaten wird selbst der Trackballcontroller unterstützt und daher übertrumpft das Spiel die Variante für die hauseigene Atari 5200-Konsole. 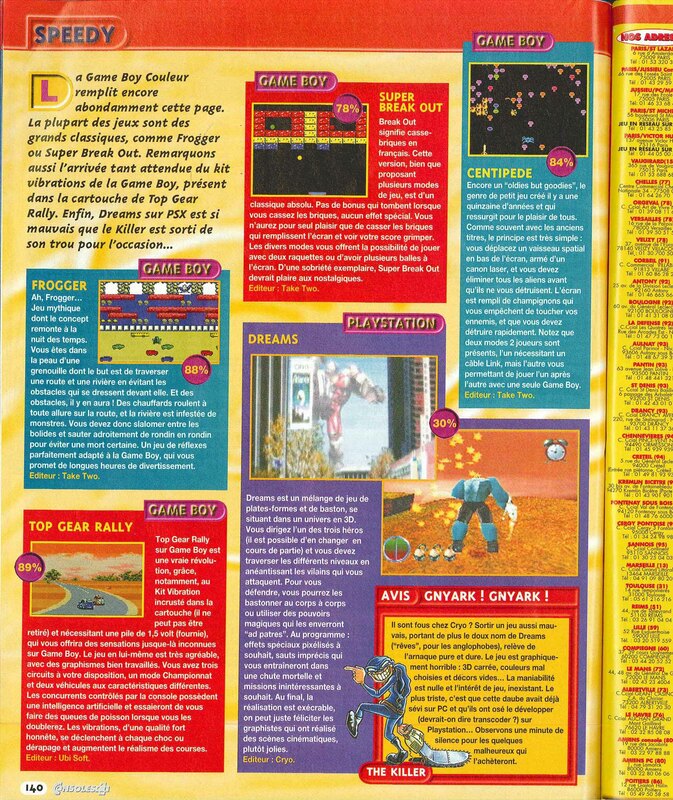 Wer also actionreiche Arcade Shooter mag, der kommt an Centipede nicht vorbei! Encore un "oldies but goodies", le genre de petit jeu crée il y a une quinzaine d'années et qui resurgit pour le plaisir de tous. Le graphisme n'est pas extraordinaire, malgré certains effets réussis mais le bruitages, parfaitement stressants, renforcent l'impression d'angoisse que le joueur ressent face à cette chenille diabolique. Succès d'arcade, Milipède en a fait frémir plus d'un. Gageons que l'adaptation d'Atari remportera un grand succès auprès des amateurs d'émotions fortes. Centipede has always been a fun game that brings high replay value from both it's fun-factor, but also it's difficulty. It looks simple enough, but those insects are down to kill and have their eyes on YOU! The Atari 5200 version is quick , fun and looks great. Even if you don't have a 5200 trackball, this game will bring back fond memories and manic fun. In den Spielhallen zählte Centipede zu den beliebtesten Videospielen; jetzt endlich taucht er auch zu Hause auf - und wird in dieser Form „Pac-Man“ als diesjähriges ATARI-Weltmeisterschaftsspiel ablösen. Ein wenig enttäuscht muß man angesichts der Grafik sein, wenn man mit der der Arcade-Spiele vergleicht Der Handlungsablauf jedoch ähnelt sehr dem Original. 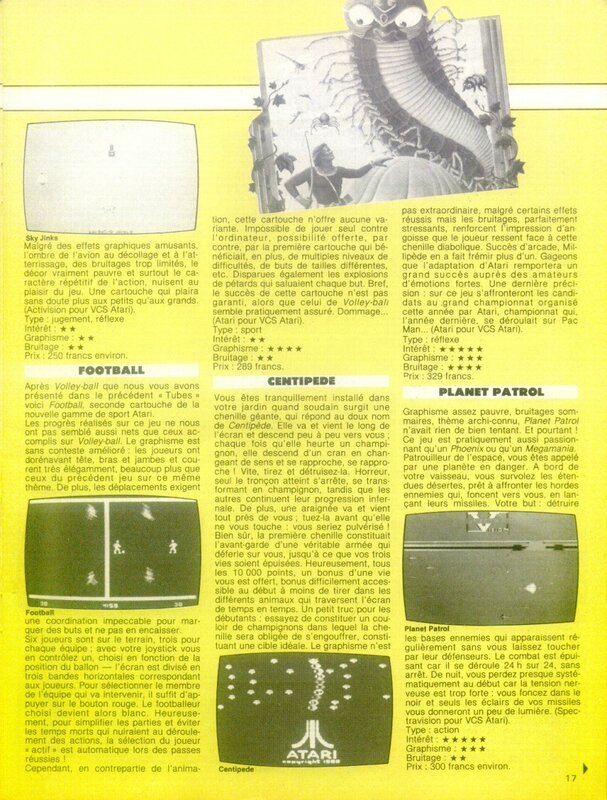 After playing a few rounds of Centipede with a Commodore 64 joystick, an Atari Trak-Ball was plugged in. To my delight, the wand traveled smoothly and accurately in conjunction with the movements of my hand, and the firing mechanism worked perfectly. The folks at Commodore were wise in creating their popular computer system with joystick ports that are exactly like those of the even more popular Atari 2600. With the huge variety of controllers available for the Atari 2600, gamers can add a large dose of Arcade realism to the many, many ports that are available for the Commodore 64. Overall, though, if you're a fan of this title in any of its previous incarnations, you're sure to like this one. Just don't expect any changes or innovative features. Ansonsten reiht sich auch die Version für das Intellivision reibungslos in die anderen Versionen des Spiels ein und bietet gewohnt hohe Unterhaltung. Durch die geringere Auflösung wirken die Sprites allerdings etwas grober und pixeliger als bei Colecovision und der Atari-Versionen. Dafür lässt sich das Spiel selbst mit der Steuerscheibe des Intellivisioncontrollers einfach steuern und auch die Sounduntermalung ist von gewohnt hohem Niveau. Einzig und allein die etwas abgemagerte Technik könnte man Centipede als Kritikpunkt anlasten, was aber an der Hardware liegt. Ansonsten hat man dank eines fetzigen Spielablaufs ein interessantes Spiel, das sich für Highscorejagden anbietet. Aufgrund der Tatsache, dass man Centipede für Atari 2600 häufig auf Flohmärkten und Onlineauktionshäusern antrifft, kann man für kleines Geld einen spaßigen Videospielklassiker bekommen. Also zuschlagen! Yep, the classic shoot the flora, fauna, and fungi has come to the GB. All the features are here, transferred lovingly to the green-screened wonder. This Centipede is quite a bit easier than most others, thanks to its slow, predictable spider and large, easy-to-shoot centipede sections. But it's still great fun. Therefore, despite the limited, even by Atari 2600 standards, graphical quality of this game, the gameplay and addictiveness more than make up for that limitation. If you are a fan of the Atari 2600 and you do not have this game, I highly recommend you get it. Doing so would be a choice you would be very unlikely to regret. Although the game is not too graphically impressive and the action can get very repetitive as well, if you love the action packed arcade original this edition is has close as you can get especially with the Track Ball controller. If you have the 5200 be sure to check out the simple but fun and challenging Centipede. Centipede is a classic shooter with a novel concept, but the graphics on the 2600 are below par. Once you decipher which blocky-blocks represent each game element, you'll notice this is a fun - albeit crappy looking - game. Nice quick arcade pace. Shoot stuff, stay alive, and keep adding credits. That's what Centipede's all about, baby. This 8-bit computer version of this game looks a bit dull and while it plays and sounds great you can't help but think that they should have put a bit more effort into making this look more like the arcade game. Zugegeben. einen Höhepunkt an spielerischer Vielfalt darf man sich von Centipede nicht erwarten, ebensowenig wie monumentale Grafik oder bombastische Soundeffekte. Aber in Sachen Ballerspaß glänzt der Flohzirkus noch ganz wie in alten Zeiten: Die Joypad-Steuerung ist so gelungen, daß selbst Fans des Automaten-Trackballs damit zurechtkommen werden, und das Gameplay ist wunderbar hektisch wie kaum bei einer anderen Knallerei. Ataris Gaudiwurm kramt man also immer wieder gerne für ein kleines Spielchen hervor, besonders, wenn ein Freund zur Hand ist! Die Grafik kommt im schlichten Stil daher und gleicht in der 1:1-Umsetzung dem Automatenvorbild. Dasselbe Schauspiel beim Gameplay: Es macht zwar mal wieder richtig Spaß, nur den B-Button zu drucken, trotzdem vermißt man auch in diesem Fall für einen Preis von zirka 70 DM ein zweites Game auf dem Modul. Other than its replacement of mushrooms with rectangles (and the fact that your wand can pass right through mushrooms), Centipede is a reasonably good facsimile of the original, and it's an intense game that shooter fans will enjoy. The game gets fast and hard in a hurry and there are only two difficulty levels, Easy and Standard, making for a significant challenge, even for those who have mastered the coin-op game. Joystick control is somewhat sluggish, but trackball control smoothes things over. While it's not the best arcade conversion on the Atari 2600, this game will satisfy, at least to a degree. All round, Centipede is a good one or two player game with well-defined graphics and good clear sound. Atari's cartridge based software for the Vic is a good idea and I am sure it will take off. Schnörkellose Spielhallen-Adaption ohne jeglichen spielerischen Tiefgang. It still is a good cart because it is portable, it just isn't great. If you went bonkers over the arcade game, then you will enjoy playing the game at home on your Vic. It's not quite as fast as the Atari version and lacks the prettiness of the original - though these are shortcomings of the Vic not the cartridge. Usually the 8-bit versions of Atari's games are fairly comparable to their arcade counterparts, but this one really falls short. Perhaps because it was programmed earlier than other versions, it really doesn't compare to the Atari 5200 or Colecovision editions. The graphics are plain, with solid-colored mushrooms. The centipede moves in a somewhat choppy manner, and the sad-looking spider isn't nearly as aggressive as he should be. In general, the game seems too slow and easy. I was able to rack up scores that far exceeded anything I could do in the arcade (over 37K!). Using the Atari 2600 track ball makes the game feel more arcade-like, but it's also more work on your arm. There's only one skill level. Despite the problems, this is still Centipede, one of the best video games of all time. But there are better, more challenging versions out there. Nostalgie-Fans freuen sich, trotz müder Grafik, über die solide Umsetzung. It's just a shame to think what Centipede could have been on the Game Boy -- instead, we just get a rehash of a black-and-white with poor color implementation. Maybe Hasbro can re-claim the license and do Centipede right. Ich war erfreut, einen “meiner“ ersten Spielautomaten auf dem Game Boy zu sehen. Leider entpuppt sich Centipede als nicht gerade zeitresistent: Die hektische Ungezieferbekämpfung, die vor zehn Jahren noch Laune machte, langweilt heute nach wenigen Spielminuten. Die wenigen Features und Feinde wurden vollständig auf den Game Boy übertragen; da es Pilze, Spinnen und Schnecken aber schon im ersten Level gibt, fehlt R-Type- und Parodius-gestählten Ballerfans die Abwechslung. Auch grafisch gibt‘s in höheren Levels keine Überraschungen: Primitive Pilze in schwarz, undefinierbares Gewusel als feindliche Schädlingsarmee. Das ist - trotz des Zweispielermodus - deutlich zu wenig. Possibly the ugliest conversion of Centipede we've ever seen, Majesco's latest Game Boy Color arcade classic plays as bad as it looks. The standard gameplay is here; shoot invading bugs as they plummet from the top of the screen. But it's a slow and pale imitation of the fast paced and addictive game that the coin-op served up. Graphically the game falls short too, looking more like a wannabe than a licensed conversion. The only aspects of worth in the game are the countless modes of play, including (linked) two-player co-op, competitive or team play. There are also four levels of difficulty, which you'll want to use to keep the game interesting, if that's at all possible. Die Neuauflage alter Klassiker ist an sich keine schlechte Idee, nur sollten Grafik und Sound vielleicht doch etwas aufgepeppt werden. Bei Centipede wurde das, aus welchem Grund auch immer, nicht gemacht, und so wird jemand, der das Spiel bis dato nicht kannte, auch nicht sonderlich begeistert sein: Von Graustufen kann überhaupt keine Rede sein, die Sprites sind für heutige Maßstäbe viel zu klein, und die im Vorspann fetzige Musik beschränkt sich im Spiel auf ein klimperndes Hintergrundgeräusch. Auch die Zwei-Spieler- Option ist im Grunde eine nette Idee, trotzdem bleibt Centipede ein Spiel, das allerhöchstens Nostalgikern gefallen könnte. Ce Centipede-ci est exactement le même que celui sorti sur les bornes d’arcade et sur les différentes générations de machines qui ont suivi. Et la Game Boy Color n’échappera malheureusement pas à l’intoxication puisque Take 2 a encore, dans ses (vieilles) casseroles, Millipede et Missile Command. Gare à l’indigestion! Unfaithful to the original, slow, dull and, ultimately boring, skip it.